This past Monday, two of my photographer friends and I went to Cleveland’s Westside Market to shoot some photos. 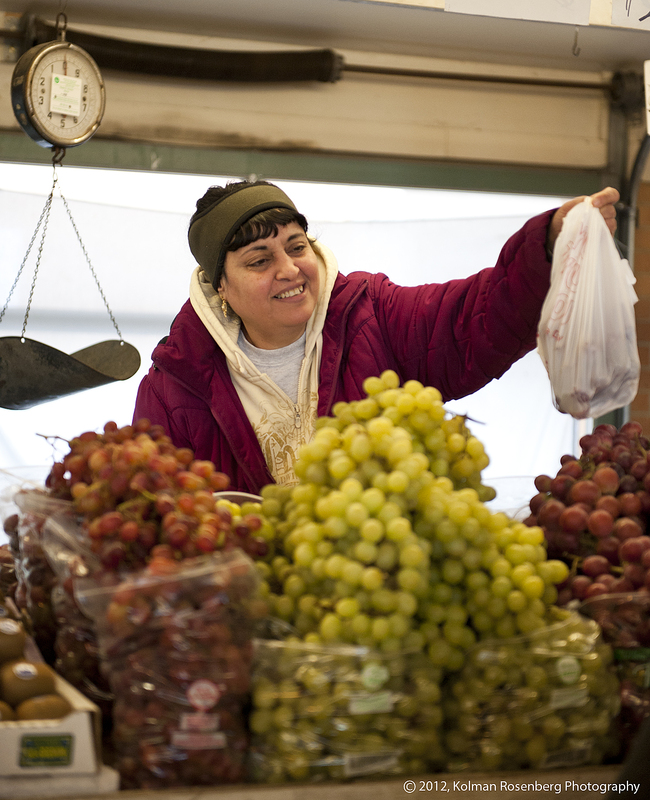 The market is a great place to shoot, whether you like to shoot architecture, food, or people. Much of my documentary work revolves around shooting photos of people at work, so that was my main emphasis for the day. Not that I didn’t take advantage of my surroundings and shoot other subjects as well though. Most of the booth employees are very used to having their pictures taken and tend to pose. I usually take their posed photo and then wait to capture some candid moments as well, which is what I am usually looking for. The produce seller seen in the photo above had a beautiful smile as she interacted with her customer and I was able to capture that expression. 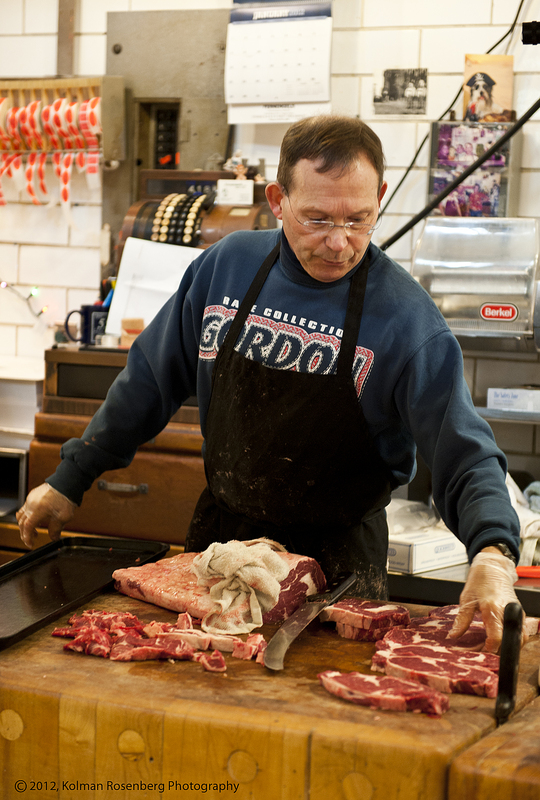 I captured this butcher as he was cutting steaks and beginning to stack them on a tray for display. I love the old cash register in the background and wish I had noticed it while there! I may have asked to take some shots of it as well. Next we see the poultry seller as she weighs the poultry on a scale and prepares to price it and wrap it. We can see her attention is on the display on the scale. 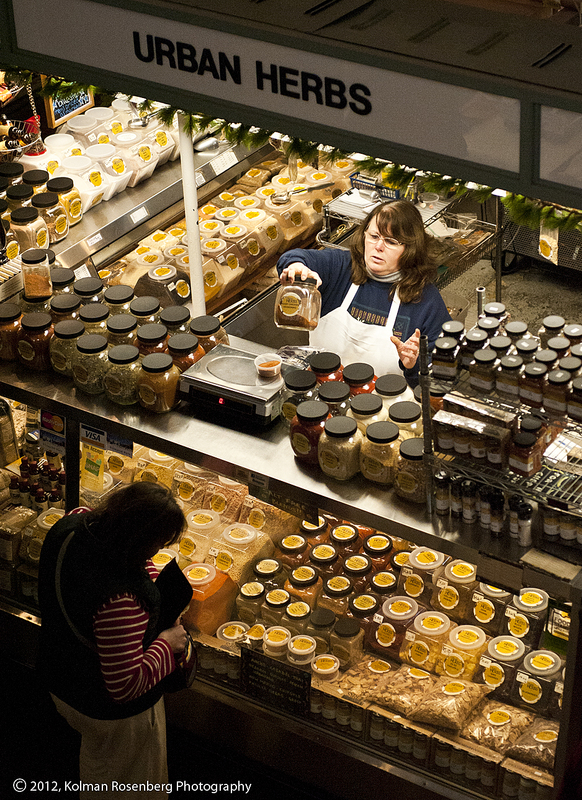 We also shot from the balcony at the western end of the market and I captured this shot of a worker at the Urban Herbs booth from above. She had just poured her product from a larger container into a smaller container sitting on the scale to sell to the customer in the foreground. Many booths, like this one, are a wonderful collection of colors and light! 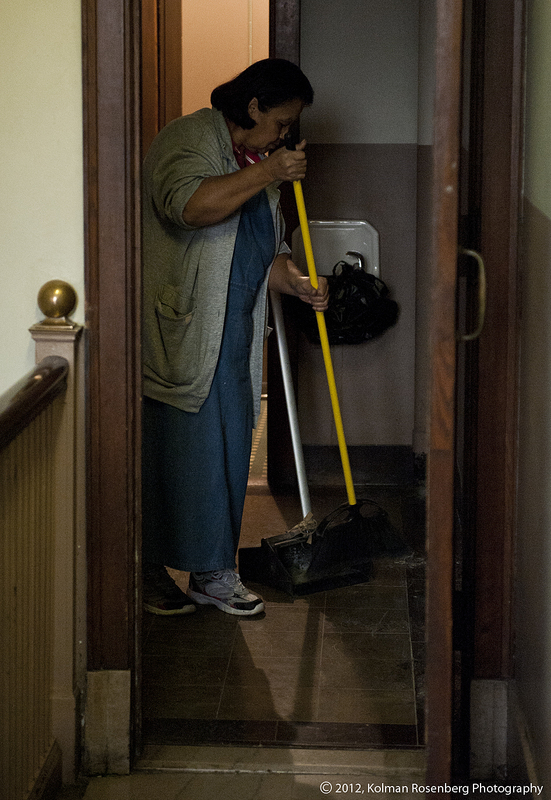 As we began to leave the balcony and venture out to shoot some photos of the Lorain-Carnegie Bridge, I capture a few photos of one the employees of the market itself sweeping the floor in a small room just off the balcony. She was in a rather dark space and this seems like the best spot to mention that all of these shots were taken at ISO 6400 on a Nikon D700. This camera performs very well at this high ISO and I chose it for all my indoor shots at the market to make sure my shutter speeds would be high enough to produce sharp photos in relatively low lighting conditions. 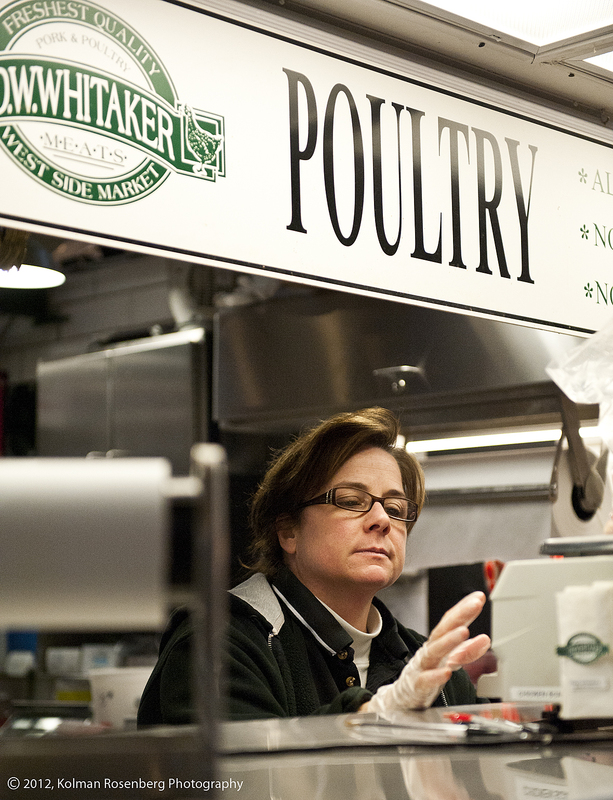 I usually make at least one trip to the Westside Market every year to take people photos. I can always depend on friendly subjects, with interesting faces, doing jobs that we all tend to take for granted. This entry was posted in Uncategorized and tagged 6400, Balcony, Bridge, Butcher, Cleaning, Cleveland, D700, Herbs, iso, Market, Meat, Nikon, OH, ohio, Produce, Sweeping, urban, Westside, Westside Market. Bookmark the permalink.